Spirits, poltergeists, phantoms… or, more commonly, ghosts have piqued the interest of the human mind for ages. Perhaps it’s the allure of the unknown that attracts us. Maybe it’s our desire to connect with those that have left this spiritual plane. Or maybe it’s all the spooky horror movies that bring us thrills at the local movie theater. Whatever the reason, we can never seem to get enough of ghosts, especially during Halloween time. 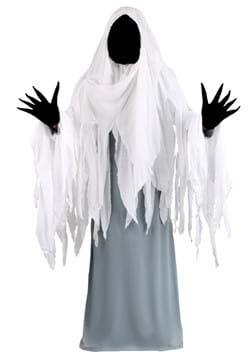 After all, it’s the perfect time of year for supernatural activity and it’s also the perfect time to dress up in one of our ghost costumes. 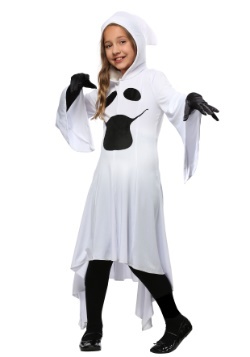 That’s right, perpetuating the paranormal aura that comes with Halloween has become a tradition, where kids dress up in every manner of ghoulish outfit. 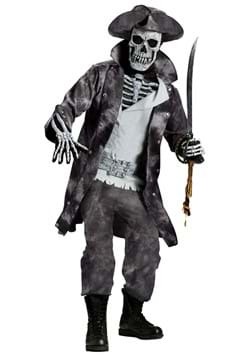 It just wouldn’t be Halloween if the usual suspects, like skeletons, zombies, and ghosts weren’t roaming the streets, and we carry a great selection of costumes for both adults and children to help continue this tradition. This handy guide will help you decide which one to choose for your next Halloween of costume party experience. When people say the word “ghost”, so many different images might pop up in people’s heads. 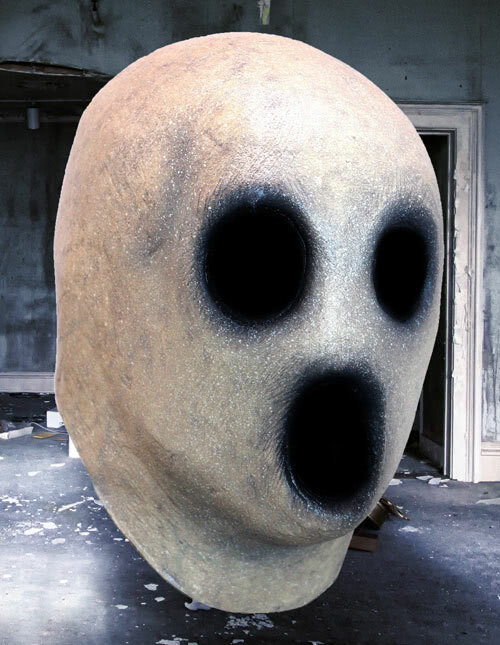 Although some people might think of Casper the Friendly Ghost, most people probably think of spooky creatures that haunt old houses. 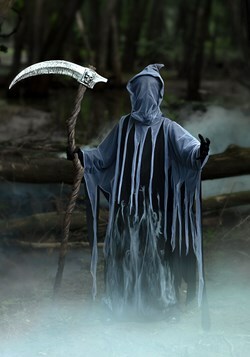 Most of our adult-sized costumes capture this eerie nature. 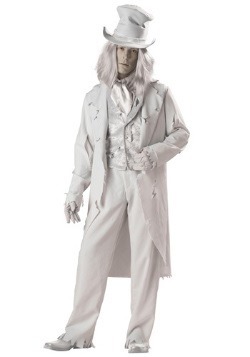 Whether you want to be the lost soul that haunts the old woods, or a creepy Victorian guest that died in a party accident centuries ago, these ghost costumes each bring a slightly different twist on the idea of a spooky specter. This first costume reminds us of the kind of geist who wanders through the woods, searching for shelter from his tortured past! 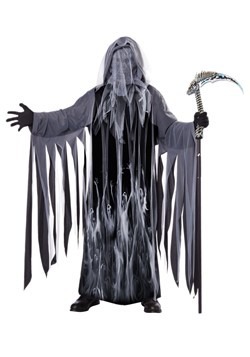 Of course, you can just use this spooky ghost costume to scare trick or treaters as they come skipping up to your door! It’s one of our exclusive costumes, so our costume designers put a huge amount of time and care into it. 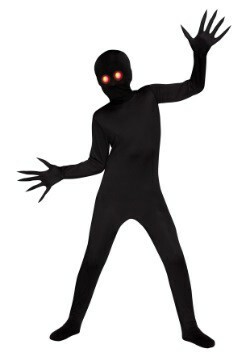 The faceless mask adds a mysterious style to the costume, so no one will know who you were in life. 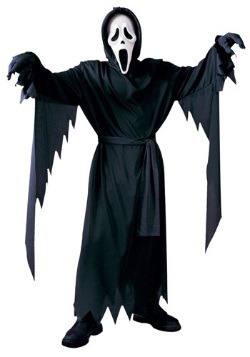 Next up is an eerie costume for the ladies. 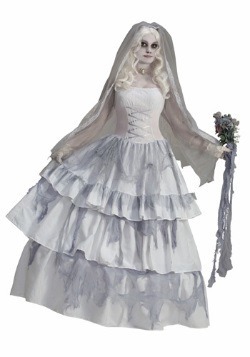 This Victorian ghost costume combines the look of a classic Victorian woman with that of a tattered phantom. 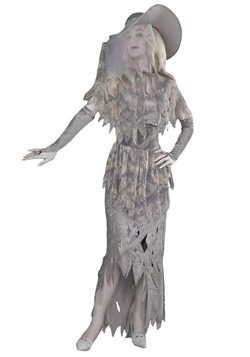 Complete with a dress that looks like it came straight from the afterlife, this costume makes sure you’ll be looking your spookiest when you head to your next masquerade party. 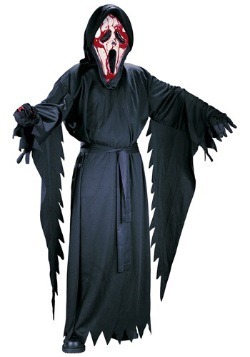 Don’t forget to practice your ghastly “woooooo” before slipping into this costume. This ghostly character was never able to make it to the altar in life, but that doesn’t me he has to spend the rest of eternity haunting the world of the living all by himself! 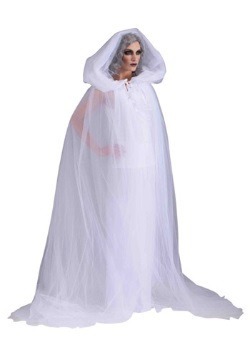 That’s what this ghost groom costume is all about. It combines the charming look of a man ready to tie the knot with the aged sensibilities of a ragged spirit, forced to spend his time traversing through the world of the living. 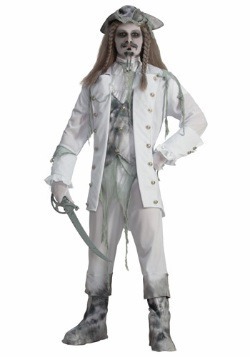 Just make sure you find yourself a bride if you plan on dressing like the ghastly groom. 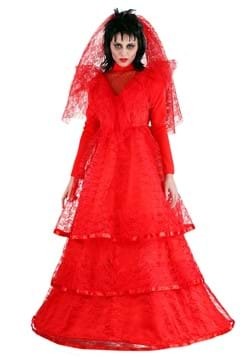 Every woman should get her big day, even if that means having it during her afterlife! 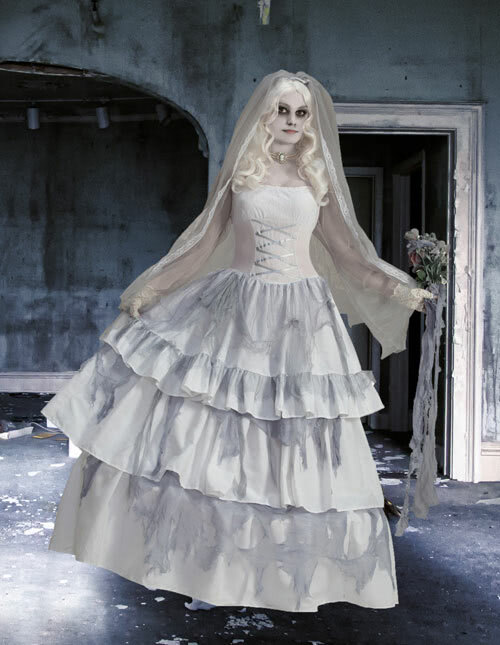 This ghost bride costume helps any ghostly girl have her big wedding day with a look that combines classic wedding dresses with an ethereal charm. 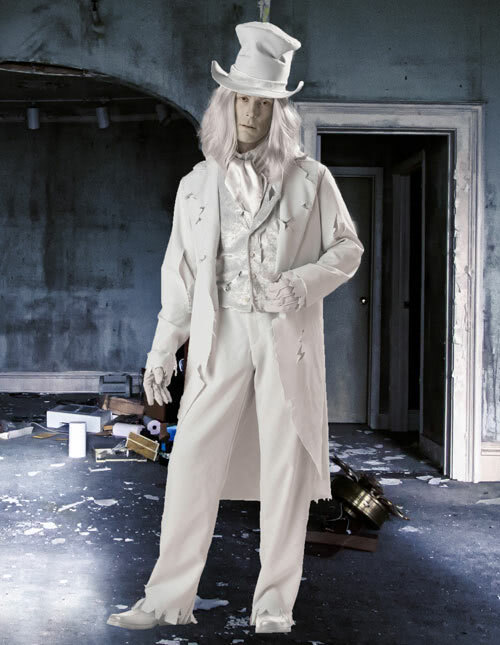 Just invite all of your ghostly guests and it might just put a whole new meaning to the phrase “white wedding!” Just make sure you choose a groom to be your forever man if you decide to hold a ghastly wedding of your own in this outfit. Wes Craven has crafted some of the wildest thriller moves of the last few decades. Of course, he invented the Nightmare on Elm Street franchise, where Freddy Krueger terrorized young kids in their dreams. He dabbled as a producer in Dracula movies and even as an actor in Jay and Silent Bob movies. He also struck gold with MTV’s classic horror film, Scream. In the classic scary movie, a mysterious killer ends up murdering a bunch of victims in a small town. The killer in that movie used a Ghost Face mask to hide his identity until the very end. 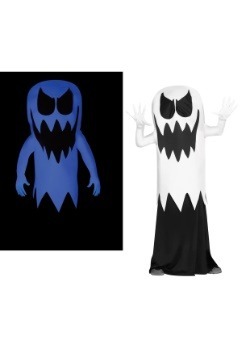 That makes the Ghost Face look a great way to dress up when selecting a ghost costume. 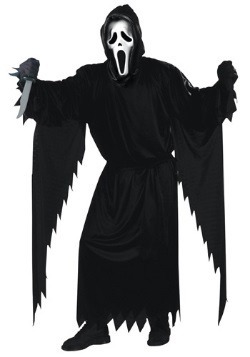 First up is the classic Scream costume for adults! 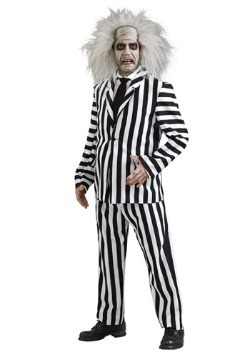 Now you can look like the unidentified killer from the original film. Will you follow the rules of horror movie tropes, or will you wander your neighborhood scaring unsuspecting trick-or-treaters? The choice is really up to you! The Scream movies are so well known that Ghost Face is even a favorite among kids. 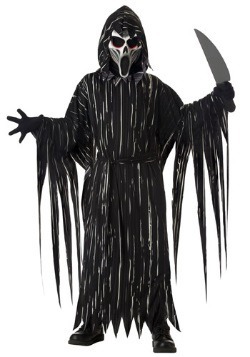 After all, that ghastly mask that he wears is pretty well known in pop culture and kids tend to gravitate towards things that are scary, so it’s no surprise that your child might want to get all dressed up in this kids Scream costume . 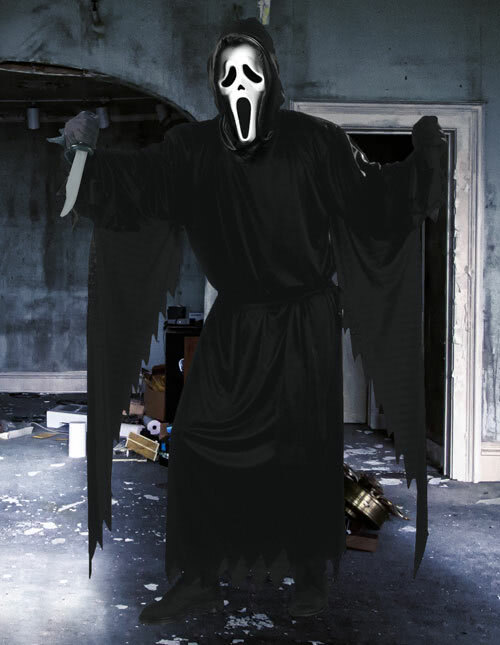 After four successful movies, the Scream franchise eventually transformed into a series on MTV. 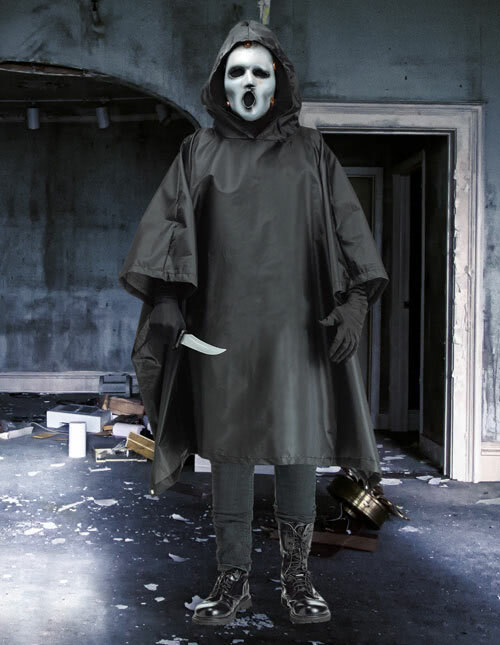 A new cast and a redesign of the costume were in order for the show and that’s how we got this new MTV Scream costume . It has a scary update to the classic mask and now the robe looks a little less like a Halloween costume and a little more like a rain poncho. It’s the perfect way to bring the classic villain into a new generation. 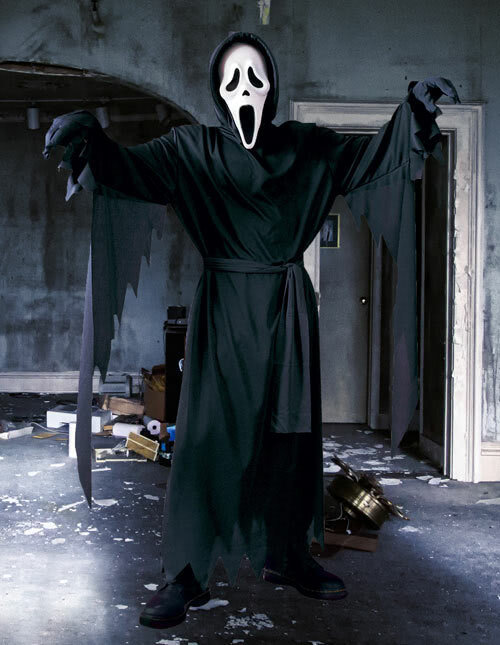 The most important part of the Scream costume is the Ghost Face mask . 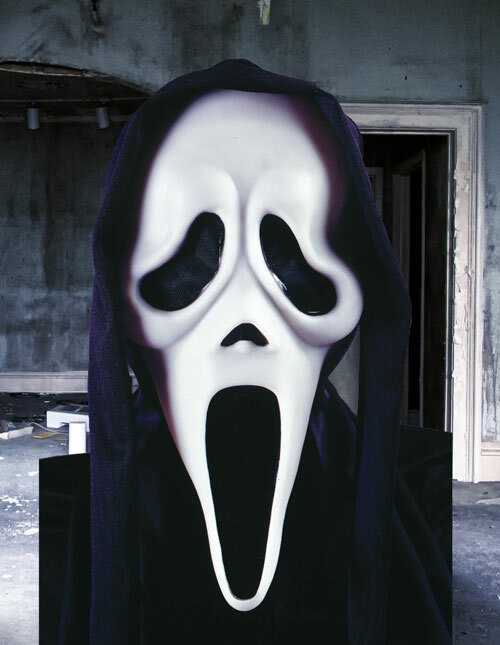 It’s one of our scary masks that has stood the test of time, since it used to be a regular ghost mask until the Scream movies turned it into a piece of pop culture. This version fits quite easily over your head and you can wear your own black clothes to fully get the serial killer look from the movies. 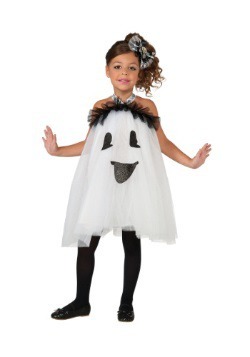 Kids have been dressing up as ghosts ever since Halloween became a mainstay for trick-or-treating. 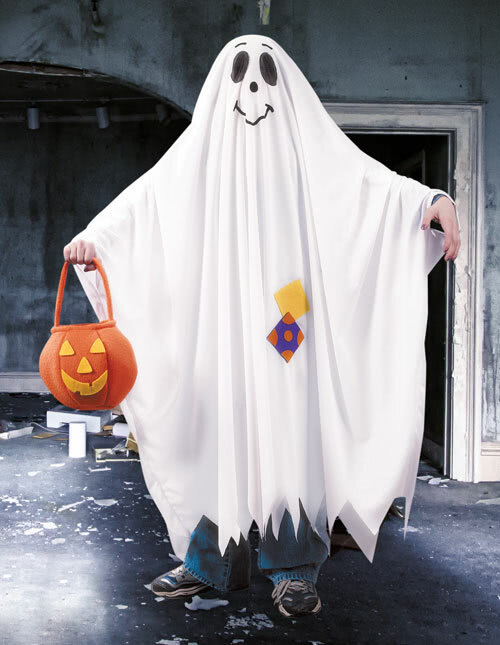 The classic bedsheet ghost has been worn by plenty of pop culture characters, including Charlie Brown from Peanuts, E.T., and Charlie from Willy Wonka and the Chocolate Factory. 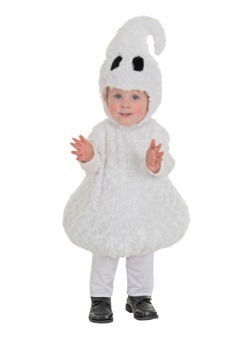 These days, the ghost costumes for kids have gotten a little more detailed. 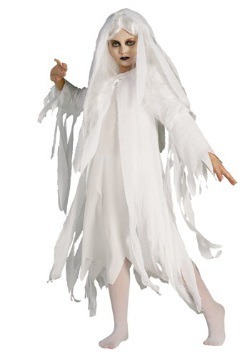 Check out all these great options for dressing your child up like a ghost without ruining your perfectly good bedsheets. 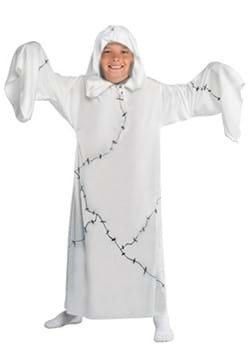 Our first costume on the list is this kids ghost costume . 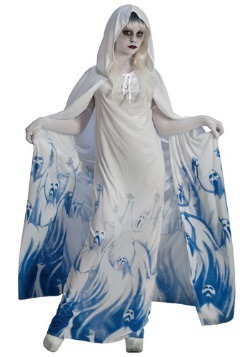 It’s based on the iconic bedsheet ghost trope and is one of our most affordable options. It comes with a robe with a friendly face printed on the front. It’s a quick and easy look that saves your bedsheets from being ruined for your next trick-or-treat outing with your child. 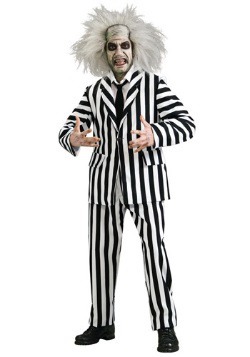 This next costume heads to the other end of the spectrum! We go straight from friendly to bone-chilling. 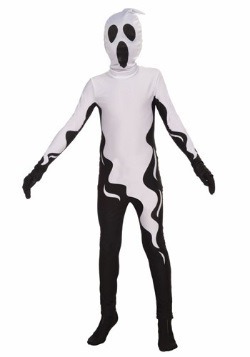 This boys ghost costume is a spooky outfit that will haunt your dreams at night. 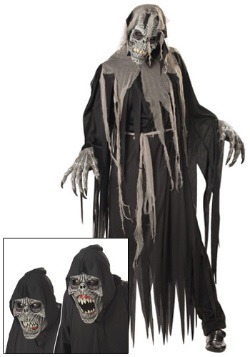 It comes with a full-body robe with an attached, faceless hood to give your child a ghastly look to wear. 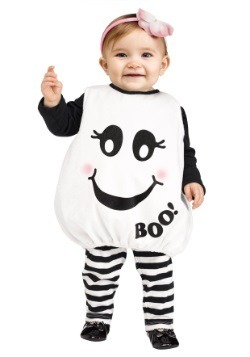 Just make sure you warn your neighbors about your little one wearing this outfit, since they might just think that your neighborhood really is haunted. Some ghosts have a little more refinement as phantoms. 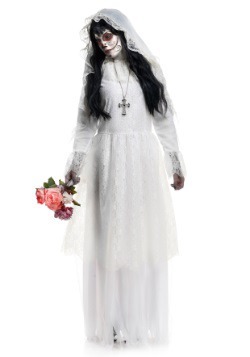 Your little girl could be one of them with this girls ghost costume . 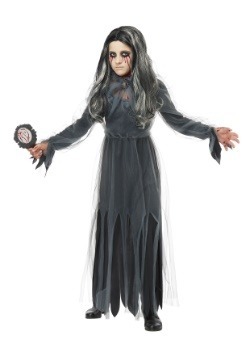 This fancy outfit brings your child a look that’s both elegant and frightening as it comes with a billowy dress that has that tattered look of the haunted dead. 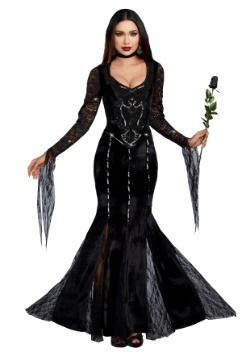 The costume also comes with a waist chain accessory to complement the look. 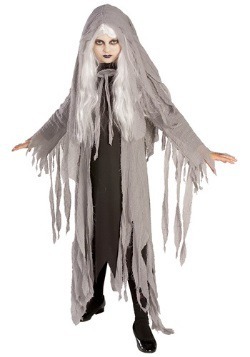 Make sure to add a set of ghostly makeup to her look to get the full effect! 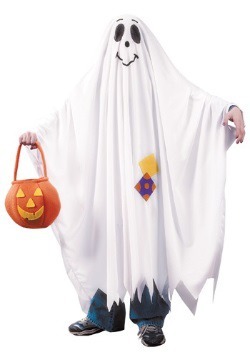 Even the smallest member of your family can get in on the ghostly fun with this toddler ghost costume. 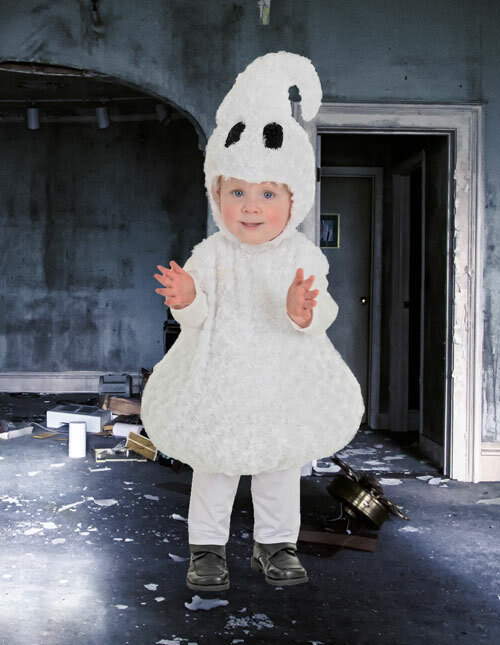 With a look that’s not too scary and plenty sweet, this cute toddler ghost costume gives your child a look that’s adorable and huggable, but still fits in with your family ghost group costume theme! 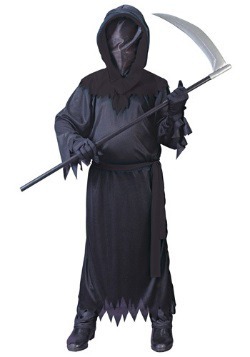 The costume comes with a plush body tunic and a matching hood and is quite easy to put on and take off, so you shouldn’t have any problem getting your little one to wear it. We probably don’t have to tell you how great the Ghostbusters movies are. Not only did it highlight the great comedic abilities of Bill Murray, Dan Aykroyd, Harold Ramis, and Ernie Hudson, but it also gave us some new takes on the classic poltergeist. Slimer, the little green ghost based on John Belushi, shows us that sometimes ghosts aren’t always bone chilling. Sometimes, ghosts can be kind of adorable. 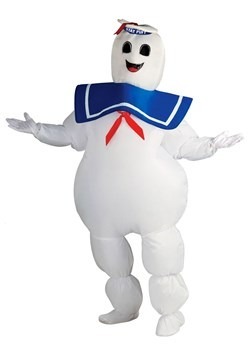 That makes Slimer a great costume choice for anyone looking to dress up like a ghost this year. 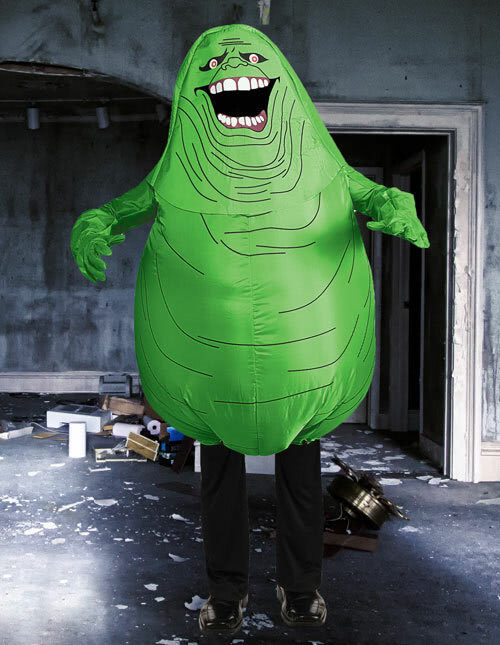 Just check out some of our cool Slimer costumes for both adults and kids. Slimer has a pretty great life. He spends most of his time hanging out on 12th floor of the Sedgewick Hotel. There, he gobbles up plenty of tasty snacks and crashes in whichever hotel room he feels like taking a nap in. Then he likes to slime the Ghostbusters whenever they come for a visit. The only thing he as to watch for is those nasty proton streams that they come packing! 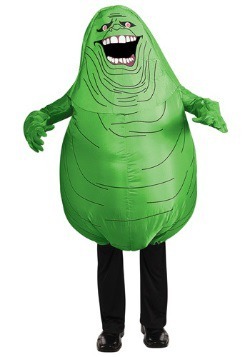 If you want to trade in your humdrum life for the luxurious life of Slimer, then give this licensed Slimer costume a try. It’s inflatable, so you’ll have the green bulbous look with ease. Perhaps you were thinking about heading out as one of the Ghostbusters yourself. 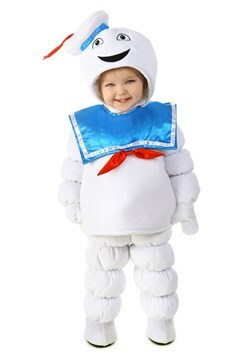 Well, then your little one can join in on the fun by becoming the iconic ghost from the movies. 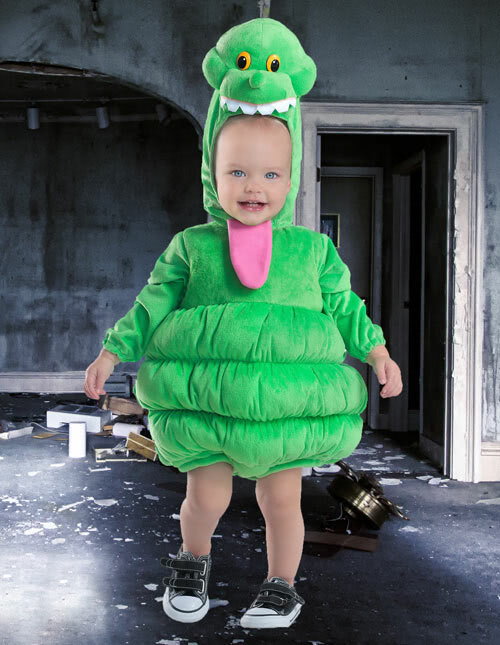 This infant Slimer costume gives your baby an incredible option when trying to form a Ghostbusters group costume. 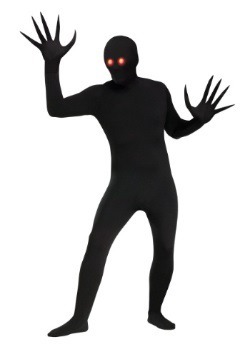 It’s a soft tunic costume made out of green polyester fleece that will have your little one ready to tag along on your paranormal hunting activities! Dressing like Slimer doesn’t mean you have to cover your entire body in slime! Heck, you don’t even need to wear a full-body costume to get the look of the classic green ghost. 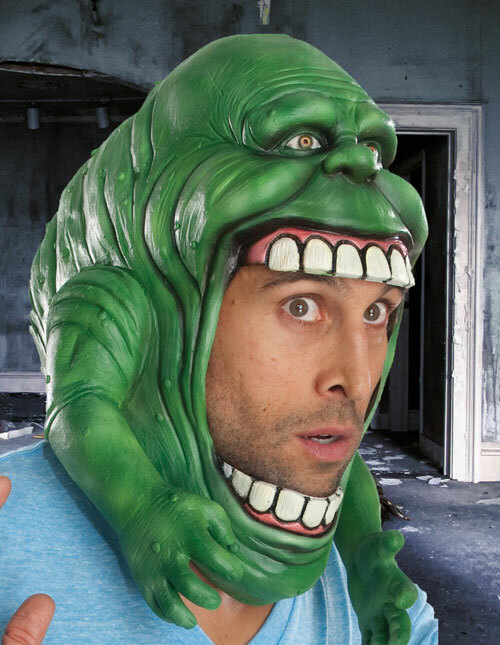 You only need this Slimer mask , which is molded to look just like the paranormal creature from the movies. It’ll look like he’s sliming your head when you put it on, so make sure you steer clear from any guys carrying proton packs. Slimer isn’t just for babies and adults (although the only people who can truly enjoy the experience the joy of dressing up like Slimer are those who are old enough to remember Ecto-Coolers). 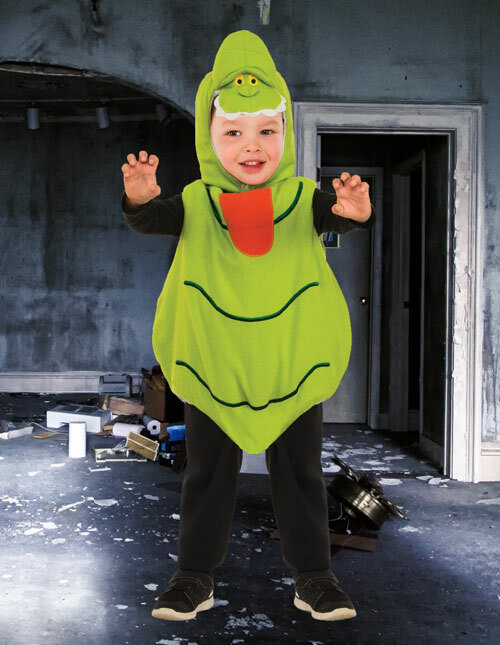 This kids Slimer costume is a licensed costume from the Ghostbusters movies that will have your child ready to join your family Ghostbusters group. Accessories are one of the most important additions to any costume! 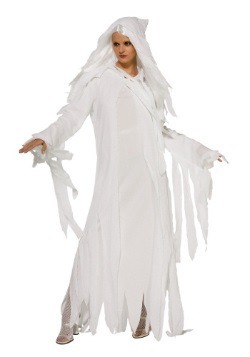 They’re a quick way to add a finished look to any outfit, and ghost costumes are no exception. 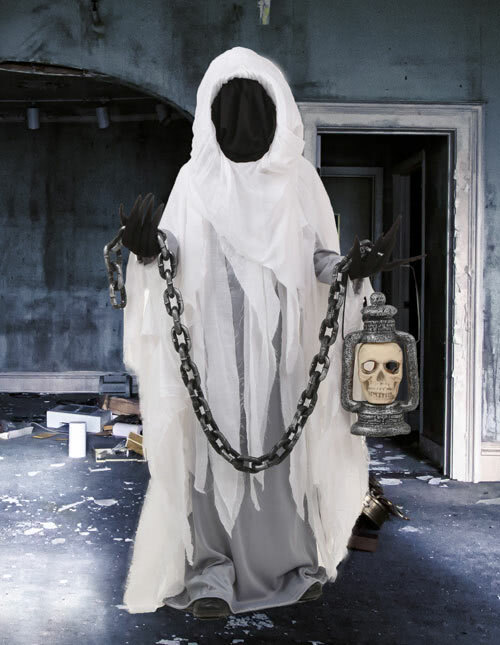 We carry plenty of scary accessories to add to your look, so we went ahead and narrowed it down to our choice of top four essential ghost accessories to add to your costume. Just check them out below. 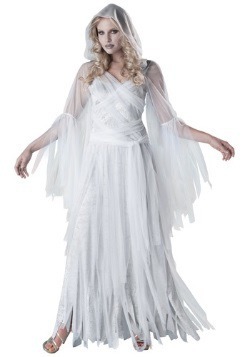 Ghosts always have a glowing, white ethereal appearance. The perfect way to get that kind of look isn’t by throwing a bunch of flour on your face. It’s a makeup kit! 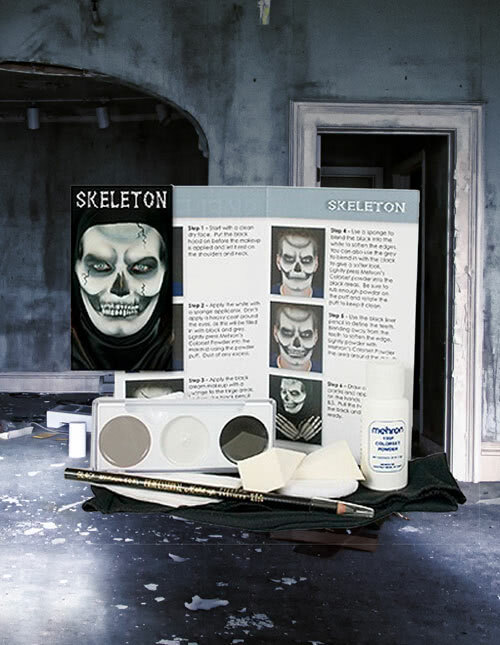 This particular ghost makeup kit gives you all the tools you need to lighten up the look of your face to create a style that comes straight from the afterlife. 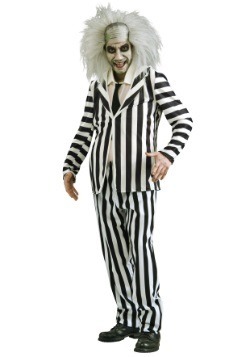 Just pair it up with any of our scary costumes and you can be off scaring unsuspecting victims in no time. Just because you plan on becoming a dead spirit doesn’t mean you have to give up your hair! If movies with spirits in it have taught us anything, it’s that some of those ghosts have some pretty rocking hair. Just look at Patrick Swayze in the movie Ghost. 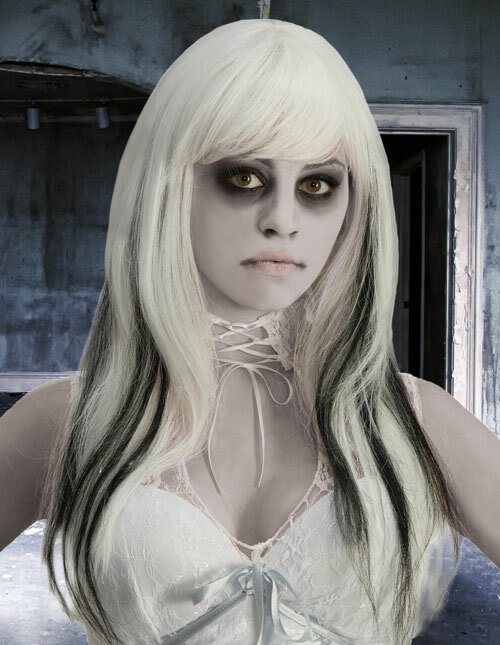 This ghost wig is an accessory for women that will help you have a great hairstyle while you dress up as a ghastly visitor from the realm of the dead! 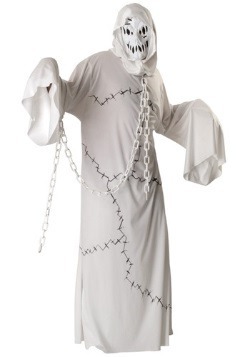 Ever since Charles Dickens’ A Christmas Carol, chains have been a part of the popular image of undead spirits. 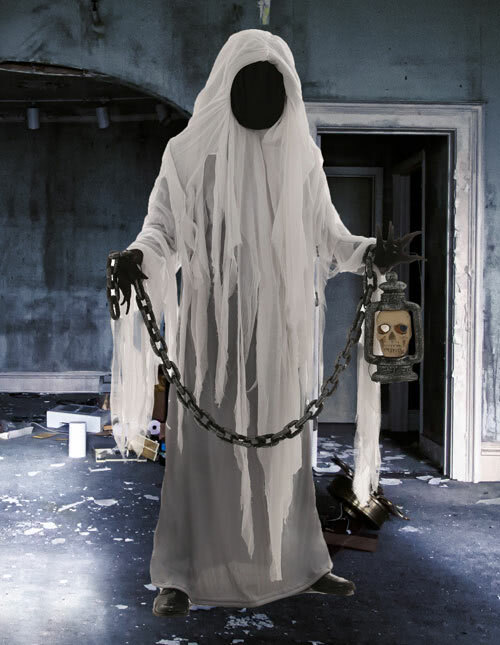 Marley’s ghost walked around with the chains of his past life attached to him during his spirit form. 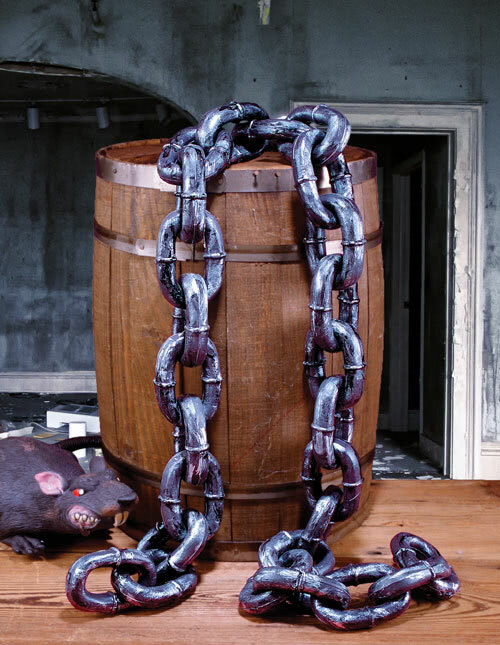 This chain rope is an easy accessory to add to any ghost costume. 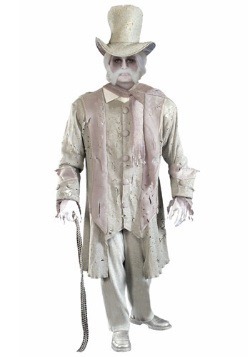 All you have to do is drag it around like the late Jacob Marley to add a creepy effect to your look. 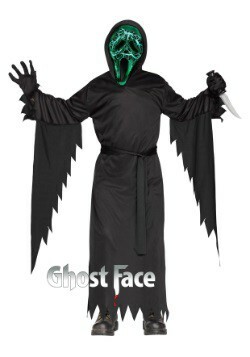 If you want to scare the pants off of your friends and family, then you need a ghost mask that really delivers the full horror movie experience. 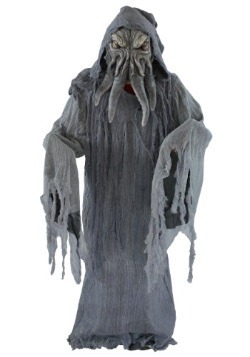 This ghastly accessory is just one of our scary masks that has a blood curdling effect. It’s made of 100% natural latex and is made by Ghoulish Productions and should be enough to put a fright into anyone who lays eyes upon you.